What an amazing sensation: because of some vulcano eruption many thousand kilometers away the entire air traffic has come to a halt – mother nature shows us her power again and we have to realize how tiny we are and how much we depend on flying; especially the travelling musician who has gotten used to dashing back and fourth between continents suddenly has to change plans, cancel concerts and maybe even take an unplanned holiday. Did I get affected? Yes, just a little bit 🙂I had spent four lovely days in the city of my dreams, the crown jewel of European capitals,Â the city of love, Paris. City of love especially for me, since my first “real” girl-friend was French, and back then she lived in Paris, so I knew it quite well from 1989 on. So many fond memories pop up as soon as I get out of the RER (train from the airport), smell the Parisian air, see the beautiful Haussmann buildings and feel the energy of this pulsating city. Holidays again? 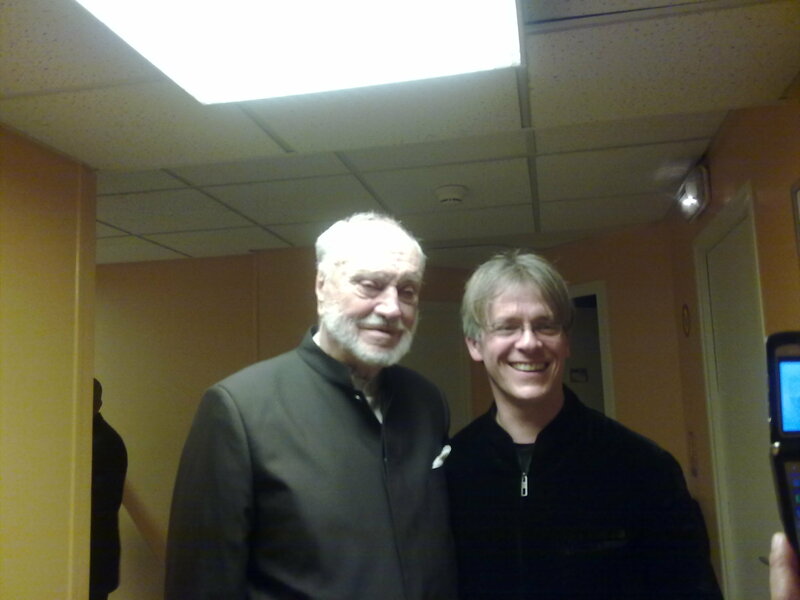 No, “work”; two times Dvorak Concerto with the Orchestre National de France at the Theatre Champs-Elysee with two different conductors: first night I had the 82-year-old Kurt Masur, and the night after very young Indonesian Adrian Prabava. In 1991 I had met Kurt Masur at the house of his parents-in-law in Tokyo (through the German cultural attachÃ©e) and accompanied him strangely enough with Schuberts ErlkÃ¶nig – spontaneously and without music, a story he kept on telling whenever he introduced me to people in New York, where we met in the mid-nineties and where a rather fond friendship developed between his wife Tomoko, his son Ken (whom I had just seen in Houston – he is assistant conductor in San Antonio) Kurt himself and my own little family. When asked if he would be one of two Godfathers for my son JÃ¡nos he accepted with the words that he might not be able to ever play soccer with him. When we met he was 61 years old, and now at 82, not at all hindered by his slight Parkinson, his mind and ears as clear as always, I feel how his charisma has tripled and how this fact inspires not only the orchestra but also his soloist. Maybe at times a bit slower than what I would have chosen, I felt incredibly touched by the music he demanded and received from the orchestra. The sound was deep yet never heavy, and I felt carried all the way through the performance, carried on a bed of softest feathers; no rocky transitions, no vanity, no pompous rubati, just music-making of the purest kind, true Dvorak from the heart. I haven’t dared listening to the recording they gave me afterwards since I am so afraid that I didn’t do justice to this sensitive collaboration. My trip to Leipzig took almost nine hours. I arrived at 4:15 pm at the hotel and spent the most efficient 90 minutes ever in a hotel room: I practised the Rococo’s for 50 minutes, slept 25 minutes, showered 10 minutes, got dressed in 3 minutes and was perfectly in timeÂ for the 5:45 pm pick-up by Frank Erben, the conductor of the evening. Rehearsal was at 6 pm, concert at 7h30, and after a lovely Italian dinner I drove my own car back home (my manager had come from Berlin with it). Frank Erben is actually concert master of the Gewandhaus Leipzig, but when he asked me after I played the Tchaikovsky with the Gewandhaus Orchestra couple of years ago, if I would perform the same piece with his small orchestra near Leipzig, the West-Saxonian Symphony, I agreed immediately because real good concertmasters very often make excellent conductors. And I wasn’t disappointed: in a lovely little hall this orchestra played with so much heart and musical will that small technical short-comings didn’t matter whatsoever. They followed me incredibly well under the guidance of their brandnew conductor and I suddenly realized while sitting as fourth cello in the section in Dvorak’s 9th Symphony, that good music making doesn’t depend at all on money, prestige, fame, not even on technical excellence and pure perfection, but on the desire to create something together, by putting all musical energy in the same basket with no “if’s” or “but’s”. This is also the secret of youth orchestras which can play as well as any top orchestra, even though every single one of the young players isn’t as ready and perfect as the professional musicians. I felt blessed to be able to enjoy this performance as much as the excellent interpretation of Dvorak 8th Symphony in Paris the night before, and I must add, that it is indeed a skill I had to learn. At the beginning of my career as a listener I was spoilt by the quality of the Berlin Philharmonic Orchestra, the orchestra of my father, and I couldn’t enjoy anything lesser than that. At some point, about 15 years ago, I realized how arrogant and dumb this attitude of mine was – I was depriving myself of some great music making by so many other groups, just because I let myself be distracted by technical problems, the “imperfect” sound and not-impeccable ensemble playing. Yes, we all have to strive for perfection, but perfection on every level, not just the right notes, and sometimes running behind the only goal of playing together and in tune is missing almost 50% of the actual point of making music. Oh no, please don’t misunderstand me, I LOVE listening to great orchestras and wonderful performers – all I am saying is that sometimes in places where you don’t expect it you can listen to some very authentic and true music making. I know many listeners who love to go to music universities and listen to student recitals, just because the lack of routine sometimes brings other levels of music to the foreground. Tomorrow (Thursday) in the morning rehearsal in Mainz (near Frankfurt) with Schumann and Volkmann Concerti. At 6pm rehearsal for the concert at 8 pm in Essen (near DÃ¼sseldorf) for the same program like in Paris (with Masur+Dvorak). The next morning (Friday, early train at 7 am) dress rehearsal in Mainz, and concert in the evening. Directly after the concert I will be driven to Esslingen (near Stuttgart) where I am supposed to teach a masterclass (Saturday) for five hours until 2pm. Back to Mainz by train (2h10min) for the evening concert, and the next day a solo recital back in Esslingen (Bach 6, Ligeti and Kodaly). Only problem is that I have not really worked on the solo recital yet, which means I will have to do without too much sleep in the next few daysâ€¦. Cross your fingers!